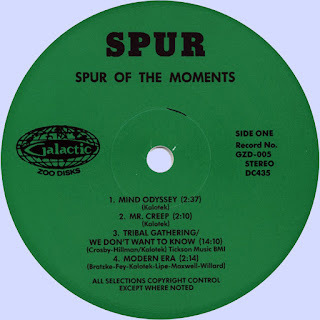 Spur was an unknown Illinois band who gained some local notoriety in the late 60’s but never hit the big time (they opened for many of the era’s big bands: The Byrds, Cream, Bob Seger, Steve Miller and The Grateful Dead). For Spur of the Moments, Drag City compiled the best tracks from their sole album (1968-), along with several outtakes and rare 45 cuts. Tons of blogs and rock magazines/fanzines have reviewed this gem, so we figured we’d give our own spin on this exciting new reissue. While Spur of the Moments is by no means a cohesive, album-like statement, each song is finely crafted 60’s rock n roll that’s well worth a spin. Spur started out life as a garage band who called themselves The Unknowns. The Unknowns would eventually change their name to Spur and touch on a variety of classic 60’s sounds: garage, folk-rock, heavy psych and country-rock. It must’ve been a challenge to assemble and piece together this anthology. Spur were certainly long-lived by 60’s standards (1965-1972) but they were also a group who frequently revamped their sound/style and spent very little time in the recording studio. That being said, Drag City does a great job putting all their highlights together in one convenient place. The LP’s first five cuts are its most brilliant ones. We begin with “Mind Odyssey,” a classic slice of psychedelic country-rock that’s highlighted by fluid guitar work and mild studio experimentation. With “Tribal Gathering,” Spur turns a classic Byrds track into a 14 minute Grateful Dead-like acid guitar jam. “Time Is Now,” another great performance, is quality West Coast psychedelia with good harmonies (about mid way through), fuzz guitar and a strong Jefferson Airplane feel. 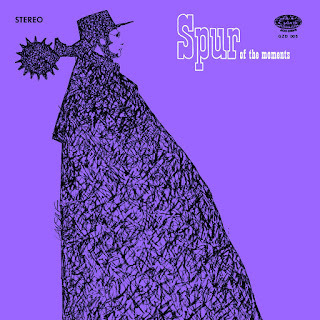 These 3 cuts also suggest that Spur may have been listening to The Byrds’ Notorious Byrd Brothers album. “Modern Era,” a 1966 single which was originally backed by a cover of Gene Clark’s “Feel A Whole Lot Better” (not included), recalls 5D Byrds, with it’s punchy, jangley guitars and acid fried lyrics – definitely a keeper.